A radio station you may not have ever heard of, is celebrating 50 years on the air today, July 5th. WWVB broadcasts the time 24 hours a day and is used by countless devices and applications around the country where having an extremely accurate time source is essential. The station is operated by NIST, and generates its time by use of a Cesium Fountain. If you have ever heard of an atomic clock, this is it. WWVB broadcasts its signal on 60kHz AM and sends out the time via Pulse Width Modulation, sending one bit of information each second. Receivers capable of receiving this signal can decode it to determine the current time within 0.1 nanosecond accuracy. The time generated is so accurate that it will take upwards of 100 million years before the time drifts a full second. I wanted to make a clip of what the signal sounds like, but I actually don't have any radios that are capable of picking up a 60kHz signal. But, I found this nice video on YouTube someone else created that can give you a glimpse. 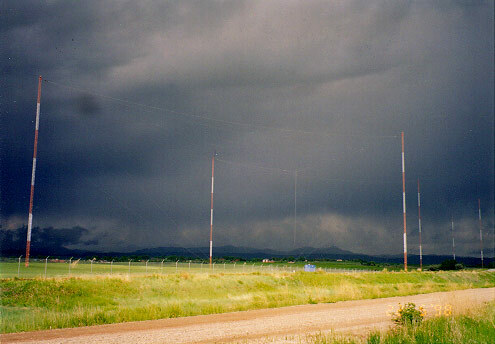 The WWVB antenna array uses an interesting design, because a full wavelength at 60kHz is approximately 5000 meters. To raise the antenna a quarter wavelength off the ground (which is the ideal height of a dipole antenna), would require a tower 1250 meters tall. According to the WWVB website, 1250 meters is 10 times the height of their current towers! To cut down the length, they are using a vertical dipole and adding length extra length horizontally across the top, and balancing the antenna with large inductor coils. Interested in learning more? The WWVB website has a lot more details. I also found this great link that discusses how to create a radio atomic clock that sets itself with WWVB. And Wired has a nice article about the 50th anniversary. If you have a shortwave radio, you can pull in WWVB's sister station WWV on a variety of frequencies, depending on the time of day. Tune to 2500 kHz, 5000 kHz, 10000 kHz, 15000 kHz, and 20000 kHz. You should be able to hear 15000 and 20000 kHz well during the day, 10000 late in the day and into the evening, and 5000 and 2500 kHz at night.